In January 2018, Brazil introduced electronic visas for the citizens of four countries: Australia, Japan, Canada, and the United States. You can get your Business e-Visa following a set of simple steps. By applying online, travelers of the mentioned nationalities do not have to visit the consulate. You can get all the information you need, submit all the required documents and pay the visa fees online. 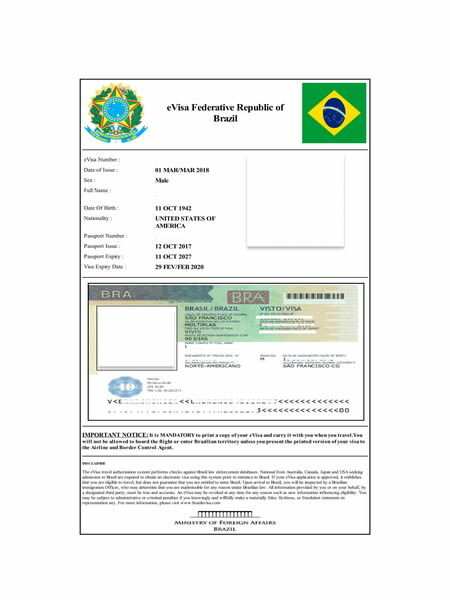 The Brazil Business e-Visa is an official document issued electronically by Brazil overseas missions that allows foreign nationals to enter and travel in Brazil for business purposes. Applicants will receive their visas via email, after filling the application form with the necessary information and once the online payment by a credit card is completed. The Brazil Business e-Visa allows for short business trips and not full-time employment in Brazil. A color scan of your passport bio page in JPEG format. Make sure to include the signature page. Currently only citizens of the following countries can apply for the Brazil Business e-Visa: Australia, Canada, United States and Japan. Only regular passport holders are eligible to apply for the Brazil Business e-Visa. All travelers need to have a passport that is valid for at least 1 month from the date of application. If your passport validity is less than 1 month, you will have to renew or apply for a new passport before applying for an e-Visa. The e-Visa is valid for 2 years. Your stay in Brazil with an e-Visa is limited to 90 days per year. You can only apply for a Business e-Visa if you are going to Brazil for business purposes. Super rush processing times for Brazil e-Visas are approximately 6 working days. What is the Brazilian business e-Visa? The Brazilian business e-Visa is an electronic travel visa which allows citizens of eligible countries to travel to and around Brazil for business purposes. The electronic visa is valid for two (2) years and allows the holder to spend 90 days per year in Brazil. The Business e-Visa for Brazil can be obtained easily by completing a simple online application. This means there is no need to visit an embassy or consulate to obtain travel authorization before visiting Brazil. What do I need to apply for a Brazilian business e-Visa? What is the cost to obtain a Brazilian business e-Visa? The business visa cost for Brazil is 44.50 USD. Additionally, there is a service fee of 35 USD for standard processing. For rush processing and super rush processing the service fee is 65 USD and 100 USD, respectively. How long does it take to process a business e-Visa? Standard Processing Time: 7 business days. How long is the Brazilian business e-Visa valid for? The Brazilian business e-Visa maintains its validity for 2 years or until your passport expires, whichever comes first. What conditions must the applicant’s passport meet for the Brazilian business e-Visa? All travelers need to have a passport that is valid for at least 1 month from the date of application. If your passport validity is less than 1 month, you will have to renew or apply for a new passport before applying for an e-Visa. Also, it should have at least one blank page. How long can I stay in Brazil with the business e-Visa? You can stay for 90 days over a period of 12 months. However, if you have a 30-day visa and you want to extend your vacation, you need to apply for an extension at the Federal Police of Brazil before your current visa expires. How will I receive my business e-Visa? We will send you the Brazilian business e-Visa via e-mail. Once you receive it, you need to print it and show it while boarding your flight and at the immigration office when you arrive in Brazil. Our recommendation is to print multiple copies so that if you lose one, you have at least one spare. I lost my Brazil business e-Visa. What can I do? Since you will be receiving your visa via e-mail, you can always print another copy. Simple as that. However, we recommend that you print multiple copies before you leave for Brazil. Put a copy in every bag you have, just in case one gets lost or stolen. That way, you can save yourself a lot of trouble. Who is eligible for the Brazilian business e-Visa? Electronic visas are available for the citizens of four countries: Australia, Japan, Canada, and the United States. That means travelers from the mentioned countries are no longer required to go to the Brazilian embassy and apply for a visa. They can do it online and get their visas in as little as four business days. How does the Brazilian business e-Visa work? The Brazilian business e-Visa allows the holder to travel to Brazil as many times as desired within the validity period which is 2 years from the date of issue. The maximum length of per year 90 days. Your Brazilian business e-Visa is electronically linked to your passport number. My Brazil Business e-Visa was denied. Can I apply again? If you have done everything right and your application is still rejected, you must go to the Brazilian embassy for an interview. What type of entry does the Brazilian business e-Visa allow? Are there additional requirements if I'm traveling with my minor child? This can be a sensitive subject so please be advised – you need to have a few additional documents if you want a Brazil e-Visa for your minor child. You, as a guardian or parent, must upload additional documents when you apply. You need to prepare a copy of the passport page and photos of both parents, as well as an authorization letter signed by both parents. If you travel with your child alone (e.g. divorced), you are required to upload an authorization form from the other parent. If the other parent is deceased, you need to have a death certificate. Last but not least, if you have the sole custody of your child, you need to have a legal custody document. The bottom line is that you need to prove that you are not taking the child out of the country without the other parent knowing. What should I do once I receive my Brazilian business e-Visa? Once you have received the approved Brazil Business e-Visa, you must print at least one copy of the document and present it to the border authorities upon your arrival in Brazil, along with the same passport that was used for the online application. It is recommended to keep a copy of the e-Visa with you at all times throughout your stay. What should I do if my Brazilian business e-Visa application is not approved? We will notify you via email if your application is not approved. If this occurs, you will have to contact the nearest Brazilian embassy for more info. Chances are you are going to need one. NOTE: Citizens of countries such as the United States, Canada, Australia, and Japan can get an electronic visa. It is obtained online and we can help you get one in no time. HEALTH: Get vaccines against Dengue fever, Yellow fever, and Typhoid. While they are not present all over Brazil, depending on the area you are planning to visit. Make sure that you get them before your travel! MONEY: Remember NOT all ATMs accept all kinds of credit or debit cards. We recommend you to carry some cash and avoid making a withdrawal in the first days of the month since people in Brazil are usually paid at the beginning of the month so you will have to wait in long lines. TOURISM: Anyone can tell you to visit the “Cristo de Corcovado”, that’s a must. BUT let’s not forget some hidden gems like Buzios, a wonderful white sand, blue waters beach, surrounded by green trees and next to a wonderful open mall, Buzios is definitely a MUST. Remember to add: The Iguazu Falls, Copacabana, Ipanema and Pan de Azucar to your list, you will not regret it. LANGUAGE: People in Brazil speak Portuguese. BUT you will find people who speak English. Don’t worry brazilians are famous for their hospitality so they will help you get around. FOOD and DRINKS: We recommend visiting a “Rodizio”, a never ending parade of grilled meats that only stops when you say so, it is the perfect barbecue experience and a classic for anyone who visits the country. For a taste of the sea you will want to try a “Moqueca”, fish, shrimp, diced tomatoes, onions and coriander are combined in a wonderful luscious stew, perfect for all clam chowder fans, take a leap and taste this treasure of the sea. If you have a sweet tooth you will definitely enjoy “Brigadeiros” they are Brazil’s take on chocolate truffles and they are delicious cocoa balls dipped in sprinkles or nuts, kids will love them. Now something the adults will love: Caipirinhas – Brazil’s national cocktail, the secret in their mighty power? Cachaça, made from fermented sugarcane juice and the main ingredient in caipirinhas. Enjoy your visit to Brazil!